New evidence from Apple shines a light on just how much the company wanted to get from Samsung in overall licensing fees on patents related to smartphones and tablets. SAN JOSE, Calif. -- Few patent-licensing companies would ever publicly reveal royalty agreements they make with others. Add Apple to the mix and you can see how that statement might be even truer. 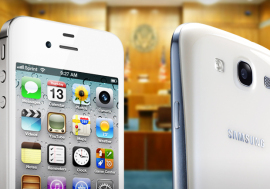 Even so, tonight Apple entered into evidence in its trial with Samsung a document showing that it offered the South Korean company a licensing deal on some of its key technologies. Specifically, Apple offered to license the portfolio of patents if Samsung would pay $30 per smartphone and $40 per tablet. To sweeten the deal, Apple offered a 20 percent discount if Samsung would cross-license some of its patents back to Apple as part of the arrangement. In addition, Apple wanted royalties on Samsung's Windows-based phones. In the document, Apple said Samsung would have owed it $250 million in 2010. Of course things didn't quite work out for both companies, which are now in a very public trial with each other. A small portion of this exhibit came out earlier today alongside testimony from Boris Teksler, Apple's director of patent licensing and strategy. Teksler told the court about Apple's three-pronged patent strategy, noting that there was a small subset of what it considered unique patents, including designs, that it did not share with others. The complete document is one of many that have become public in the case between the two technology giants. The case runs through next week, and is expected to last the rest of the month, with closing arguments and jury deliberation. Samsung faces fines in excess of $2.5 billion if Apple wins, though Samsung has also pointed patents back at Apple, something that could complicate a verdict.